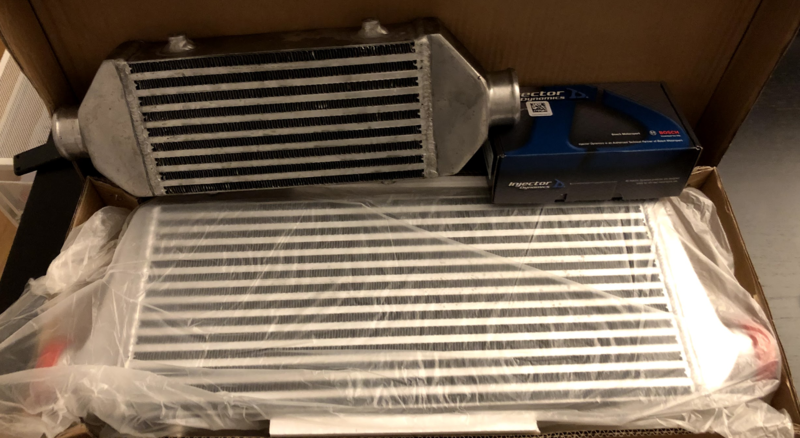 2.0" vs. 1.75" tubing pre-intercooler - Miata Turbo Forum - Boost cars, acquire cats. As a follow up to a couple of other threads, I replaced my tiny, beat up Kraftwerks-supplied intercooler with a Vibrant unit, and I took the opportunity to replace the 1.75" pre-intercooler tubing with some 2.0" tubing. The output port on the C30-74 is 2.0". As supplied, the Kraftwerks kit came with a reducer right off the Rotrex. I've done some autotuning, and some tuning via log review. Here's a comparison. Just for truth in advertising, I also replaced the recirc valve. Left side is the current tune with the 2.0" tubing. The car pulls noticeably better, despite extra weight in the front, and boost is coming on sooner. I got a max of 9.3 pounds, which is about a 0.6 pound increase over what I remember getting last November. That reducer KW provides is just stupid; guess they do it for routing/packaging. Did you upgraded to another recirc valve or a BOV? I don't think the 1.75 tubing hurts it that much, it's more to do with an intercooler that isn't garbage. The KW 2"->1.75" adapter is quite short which is not ideal. In my setup I have a very long 2" to 1.75" 45 degree silicone tube that connects the rotrex to cut kraftwerks tubing (I only didn't cut the L shaped tube). I am routing the whole thing via the hole behind the headlight. I used the shorty KW 1.75->2 adapter on the intercooler intake as there the abruptness doesn't matter as much. This routing is also much smoother. Im using 2.5" on the hot side as that is what was readily available locally. Last edited by lbatalha; 02-18-2019 at 10:51 AM. I honestly believe it's the tubing size. When I got the Kraftwerks kit in 2015, I already had a MegaSquirt. The kit came with a decent bracket that held the MAF and pre-Rotrex intake tubing in place. I gutted a junkyard MAF and bolted everything up, while working towards a real hot side, cold air intake. Removing the MAF provided a similar increase in boost to enlargificating the tubing, and a similar need for more fuel across the entire VE Table. I get my cold air from that hole under the driver's headlight. I purchased the Type 10 Universal BOV from Silicone Intakes. She idles now at about 30kPa, which is a couple of units lower than I was able to get in the past. I would like to actually check the difference in pressure across the radiator. According to others locally who have installed this kit, I am making about the same pressure at the manifold they did with the KW radiator and tubing so thats a good sign. EDIT: its weird that you are only making 9psi with the 80mm pulley, can you post some logs? 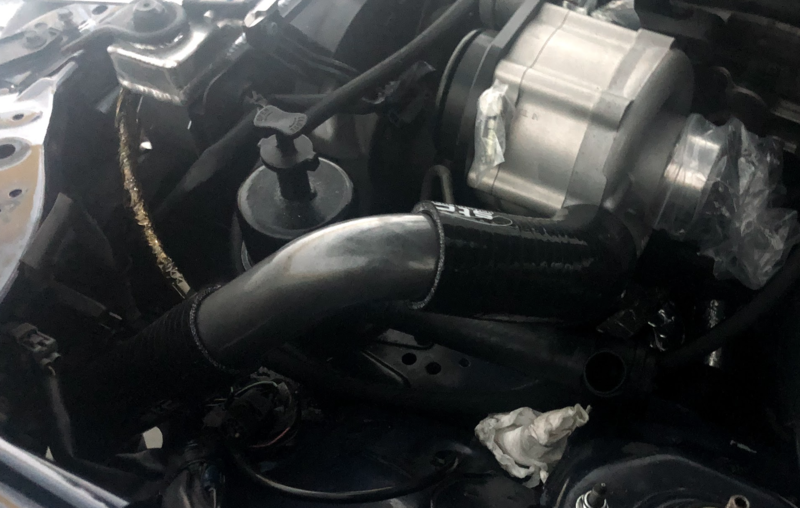 I am making 0.62bar/9psi/162kpa at 7200rpm with the 85mm pulley, EUDM VVT engine with RB manifold and midpipe (no cat, large but straight through 2.5" muffler), squaretop, stock TB.